It wasn’t ever preached from the mega-church pulpit. It wasn’t something my parents sat down and taught me. It was never scrawled on the private school chalkboard. It was more of an ethos that pervaded the white American culture I grew up in. I heard it in adult conversations. I heard it come out of my own mouth. I saw it in the way people railed against the Democratic party for giving handouts. I believed the lie white America told me: that there is such a thing as a self-made man. College continued my trek as a “self-made” man, where I worked hard and regularly ignored the fact that unlike many of my classmates, I would emerge student loan-free thanks to my parents. I powered through seminary as a full-time student and full-time employee at UPS for four years, looking down on other seminary families who accepted food stamps and other welfare programs. All the while, my education was being generously paid for by a private grant and my paltry income was being augmented by a discreet check from my parents in the mailbox each month. On top of that, I had married into a family of in-laws who oozed generosity. My mind protected this image of the shining self-made man. I told myself I wasn’t like other people who needed help. I worked hard. I fooled myself into thinking that if more people would just be like me, we wouldn’t need welfare or other subsidies. A Man Without Help Is Not Good. Now a wife and three kids later, I realize that I am perhaps the least self-made man on the planet. I have begun to realize that this idol that white America worships is not a real man, nor is he even a Christian man. The man who needs no help from anyone does not exist. At the dawn of time, God created the first man and put him in the Garden of Eden to work the land and make it prosperous. Then suddenly, in a good creation created by a good God who was declaring everything to be “very good”, came this startling statement: “It is not good that the man should be alone; I will make him a helper fit for him” (Genesis 2:18). A man in isolation is not good. A man toiling without help is not good. A self-made man is not good. The amazing beauty of the creation narrative is that God solved two problems with one solution. The man needed help, but the man also needed community. By creating woman, God provided a helper suitable for Adam. Woman provided help, and by doing so she and the man created the community that God knew they both so desperately needed. What God demonstrated is that community requires help. The love and community we were created to experience only comes about through giving and receiving help. God did not speak community into existence. As man received the woman’s help, community entered the world. A Man Without Help Does Not Exist. Middle-class white America needs to realize that we are no less needy than the folks standing in line at the Social Security office. If I hadn’t been born into a stable family with stable income and a nice house, I would be standing in line there, too. I got help from my parents. Maybe you don’t have that option. The common factor between me and you is that we both need help. Neither of us is self-made. If you are alive today, rich or poor, somebody wiped your behind and changed your diapers when you were little. If you are breathing today, that means somebody else helped feed you as a child. It may not have been a parent. But somebody–somebody besides you. What we need to realize is that our existence would not continue one more nano-second if not for the sustaining grace of the Lord. “For he makes his sun rise on the evil and on the good, and sends rain on the just and on the unjust” (Matthew 5:45) and, “In him we live and move and have our being” (Acts 17:28). The Gospel issues forth from that declaration: “It is not good for man to be alone.” We need God’s help. It is good for us to receive help from the Lord, because in the receiving of his help, he becomes our Immanuel, God with us. Community is created between God and man as we benefit from the help he lavishes upon us with his Son’s sacrificial death on the cross. “But God, being rich in mercy, because of the great love with which he loved us, even when we were dead in our trespasses, made us alive together with Christ—by grace you have been saved” (Ephesians 2:4-5). Praise God that we are a people who need help. Praise Him more that he is a God who graciously extends it to us. How many of our churches languish and lack community because we pretend to be self-made Christians? Can real Gospel community come into existence in a place where no one is willing to admit they need help? We must allow the humbling truth of the Gospel to penetrate deep into our proud hearts. 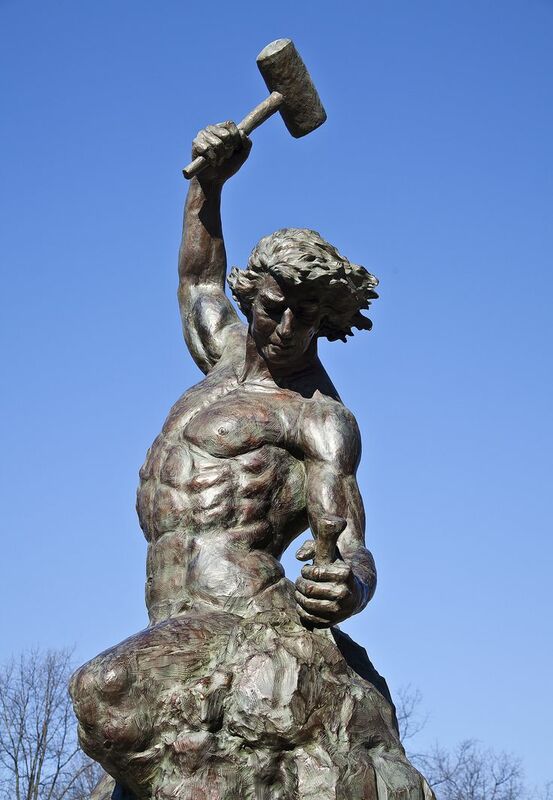 We must begin to tear down the idol to the self-made man. Only then will we see Acts 2:42-47 type of community come alive in our churches: people who need help helping others who also need help.